They may look alike, but palms and cycads represent two very different groups of plants. Of the two, palms are far more diverse, while cycads are far more ancient. Palms have flowers while cycads are cone bearing like pine trees. Both are widespread throughout the world and are grown extensively for their beauty and even as a food source. My interest here is to look at them mostly from a horticultural point of view, hence I’ve lumped them together. Let’s take a brief look at each to see what makes them seem so similar and yet in truth being so different and unique. Fossil records show that cycads are ancient, predating the first flowering plants by over 150 million years. Indeed, they were some of the first plants to colonize terrestrial habitats during the Permian Period, 280 million years ago, when Pangea, the vast supercontinent was in existence. This is one reason why they are found throughout the world today in tropical to subtropical regions. There are 3 families of cycad currently extant represented by 10-12 genera, and a little over 300 species in all. Many species of cycad are endangered, and virtually all have very restricted ranges, in some cases only occurring from one or two locations with just a few hundred plants still left in the wild. For this reason many are protected by laws and international trade in them is carefully controlled, especially the genera Ceratozamia, Chigua, Microcyas, Stangeria, and Encephalartos. The genera Zamia, Ceratozamia, and Dioon hail from Central America, but a handful of Zamia occur in South America, the southeastern USA, and the West Indies. The genus Chigua, represented by just two species, are confined to lowland rainforests of Columbia and are very closely related to Zamia. The only other New World genus is Microcycas, represented by a single species, M. calocoma, and is confined to Cuba. Africa holds only two genera, Encephalartos and Stangeria, and both are restricted to the southeast region. Stangeria is represented by a single species, S. eriopus, that is so atypical for a cycad that it was classified as a fern for many years – until someone noticed that it bore cones! Moving to tropical and subtropical Asia, Australia, and the East Indies, we encounter the most diverse living genus, Cycas. Variety within this genus is high, both in terms of leaf and trunk form, as well as habitat. In Indochina they can be found in hot, wet rainforests, while in Australia many species grow in semi-desert conditions. Australia harbors three more genera, Bowenia, Macrozamia, and Lepidozamia. Macrozamia are found primarily in Queensland and New South Wales, but M. macdonnellii is found in the Macdonnell Ranges of the Northern Territory. The other two Australian genera are found only near the coast in eastern Australia and each is represented by two species only. Palms are by far a more diverse and complex group, but all belong to the same family, the Arecaceae. To date 202 genera have been identified and more than 2500 species. Very likely new species will be discovered in the coming years since many inhabit rainforests that haven’t been fully explored. They are a fairly old group of flowering plants, dating back some 80 million years ago during the late Cretaceous Period. Like the cycads, they can be found growing across the world in subtropical, tropical, and even warm temperate climates. They can be found in almost any imaginable habitat, from temperate mountains to tropical beaches, from desert oases to tropical rainforests, submerged in subtropical swamplands, basking on hot savannas, and on and on. They have two basic forms, monopodial and sympodial, much like orchids. In layman’s terms that means some are single stemmed, such as the Cuban royal palm, Roystonea regia, while others are clump forming such as the paurotis palm, Acoelorrhaphe wrightii. Some species have become important crops such as date palms, Phoenix dactylifera, coconut palms, Cocos nucifera, and perhaps most significantly in modern times the oil palms, Elaeis guineensis and Elaeis oleifera. In the horticultural industry significant genera include Jubaea, Phoenix, Sabal, Syagrus, Trachycarpus, Roystonea, and Washingtonia, just to mention a few. Palms are used to make not only food items, but for their wax, as a weaving material, as medicines, as intoxicants, and as building materials. Diverse and often useful, palms have an important role in the lives of humans. 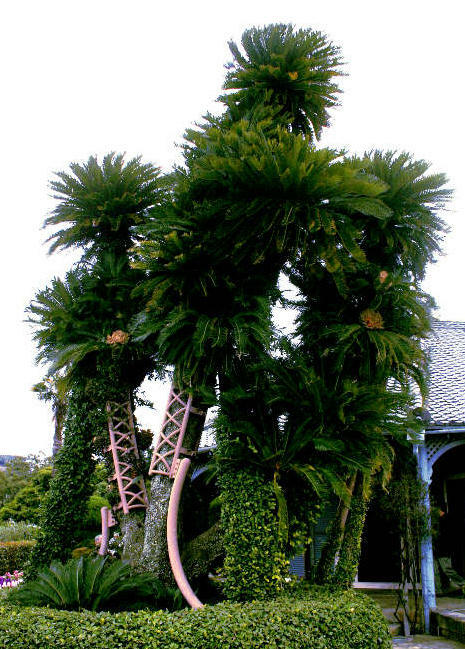 This article is about Japan’s only native cycad, Cycas revoluta, the so called King Sago palm. Of course, like other cycads it is not a palm at all, but rather a member of a very ancient group of plants that predate all flowering plants and modern conifer trees. This lovely species is perhaps the most cold resistant of all cycads and yet can be grown in tropical climates as well. 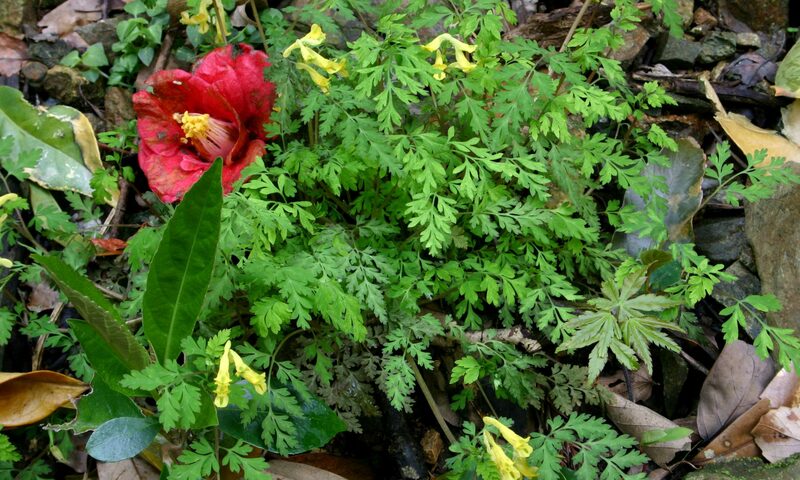 It can grow in either sun or shade, it is able to withstand both monsoonal rains and extended droughts, it responds well to both container culture and open gardens, and for the most part needs little care. In Japan it is called sotetsu, and has been an important garden plant for centuries here. Cycas revoluta is native only to Japan’s southern islands and the extreme south end of the southernmost main island, Kyushu, in Kagoshima Prefecture. It’s habitat is rocky shores where it can be found growing on near vertical rock faces in full sun. This region is essentially frost free and is classified as a subtropical climate. Winters average around 10 C (50 F) in the north of its range and 18 C (65 F) in the south. Winter extremes can go to freezing or even below in Kagoshima, but this is rare, particularly along the seacoast where this species is found. Summer temperatures throughout its range average nearly 30 C (86 F) with extremes rarely getting above 35 C (95 F) due to the moderating effects of warm coastal waters. A huge sago palm at the Glover House in Nagasaki, Kyushu, Japan. Rainfall is high with 2000-2200 mm (78-86 inches) falling in an average year. Most of that falls in the late spring, summer, and fall, particularly during the monsoon season. The summer monsoon starts early on the southern island of Okinawa, in May usually, but is a little later in Kyushu. This season typically ends in July. August is often dry, sunny, and hot, but towards its end, typhoons become more and more common and so another peak of moisture comes at this time. Falls are drier and often sunny, but by December skies grow cloudy, rainfall drops considerably, and temperatures cool down. Humidity is the one stable element – averaging between 75-80% year round. Coming from a place like the one just described, you would imagine that this plant doesn’t have much cold tolerance, but you’d be wrong! This cycad has been grown successfully in the warmer parts of the UK and parts of the southeastern USA that routinely get hard freezes. This natural ability to withstand cold conditions has made this one of the most versatile cycads for the open garden throughout the world. In Japan it is commonly seen in parks and next to public buildings, but rarely in private yards. No doubt this due to the ultimate size these plants can attain, which can mean up to 3 meters or more tall (10+ feet) and with a frond spread nearly as large. It is grown throughout the warmer parts of Japan far beyond its native range – clear up to central Honshu at least where it requires protection in winter. In terms of the USDA’s cold hardiness scale, it can withstand zone 8, and the warmer parts of zone 7 if winter protective measures are taken.